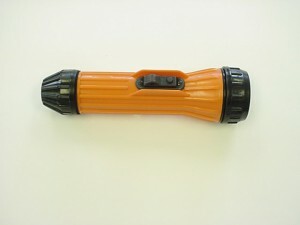 2 D-Cell safety approved 900 series flashlight. 3- position switch. Waterproof does not come with a spare bulb and holder. Orange body with black fittings. Approved for hazardous area of atmosphere containing grain dust, flour, starch, combustible plastics, hazardous vapors and gases. For use in the following explosive atmospheres only, gasoline, petroleum, naphtha, alcohol, lacquer solvent vapors, and natural gas. This approved Fulton model contains a special “circuit breaker” spring assembly which instantly disconnects the bulb from the battery in the event of a broken bulb. A potential explosion is averted since the filament is instantly disconnected, preventing a potential spark hazard.